The Middle Fork Greenway is a 6.9 mile proposed trail that will connect Boone and Blowing Rock, NC along the Middle Fork of the New River and Hwy. 321. 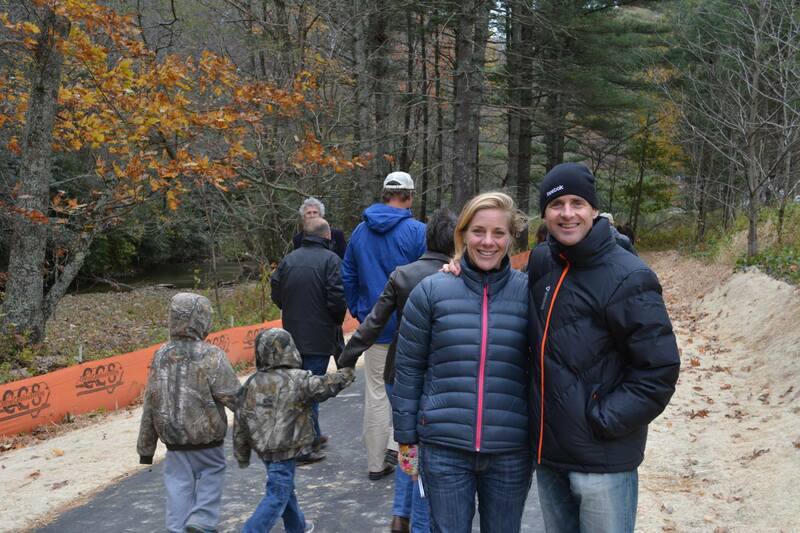 The paved, 10 foot wide trail, will allow pedestrians and cyclists to travel safely between the two mountain towns. There will be four pocket parks along the trail which will have limited parking. The time frame for the project is 6 years and the cost estimate is $12 million. 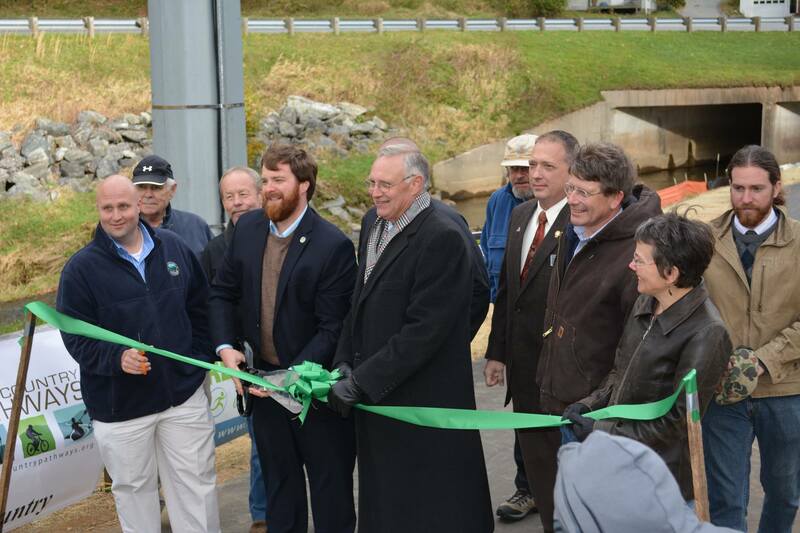 The first section of the greenway opened last year in front of Tweetsie Railroad Theme Park. A ribbon cutting celebration similar to the one today was held in the Tweetsie parking lot. The greenway ribbon cutting at Mystery Hill today is a public event with music, food, and drinks. In attendance for the ribbon cutting will be local government officials including: members of the Boone Town Council and Mayor Andy Ball; the Blowing Rock TDA, Town Council and Mayor J.B. Lawrence; and County Commissioners from Watauga County. Mayor Ball, Mayor Lawrence, and Billy Kennedy of the Watauga County Commissioners will speak today. In addition, representatives from the primary nonprofits involved in the project including Blue Ridge Conservancy, High Country Pathway, and ZAP Fitness will be present. Ann Browning of Blue Ridge Conservancy and Zika Rea of ZAP Fitness will lead the speaker portion of the ceremony. 3:25 p.m. – It is overcast with temperatures in the mid-50’s. Occasional wind gusts are making it feel colder. Community members and local politicians are beginning to show up for the ribbon cutting in front of Mystery Hill on Hwy. 321 in Blowing Rock. A local band, Mountain Radio, is playing folk and blue grass music. Additional musicians are set up in the culvert under Hwy. 321. The culvert connects Mystery Hill to the Sterling Creek pocket park. Food and drink is set up on four tables provided by Stick Boy Bread, Co. and Bald Guy Coffee. An announcement was just made that the ribbon cutting ceremony and speakers will begin at 4:00 p.m.
3:50 p.m. – Over 100 people are mingling on and around the greenway in anticipation of the speakers. It is still cold but this is a hearty group of outdoor enthusiasts. Many families are in attendance for the scheduled kids’ race following the speakers and ribbon cutting. Ann Browing of Blue Ridge Conservancy introduces the guest speakers. 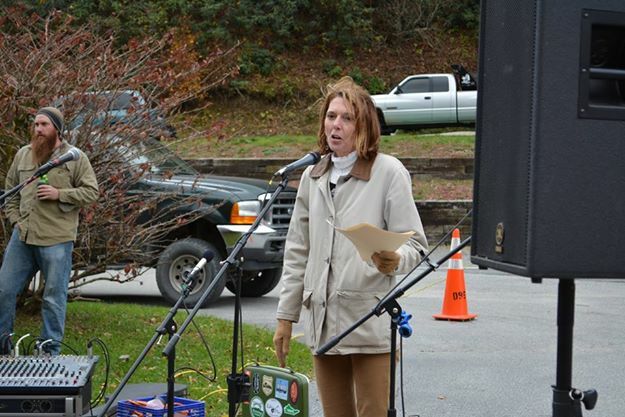 4:00 p.m. – The musicians stop playing and Ann Browning of Blue Ridge Conservancy approaches the microphone. She thanks everyone for braving the cold weather to attend the event. She then gives background on the greenway and discusses the connection between Tweetsie Railroad and the new Mystery Hill section. She states that the Tweetsie section was completed in 2013 and this new section was completed last week. The two sections are connected to make approximately 1.1 miles of greenway. She announces that the next section will be in Blowing Rock near Shoppes on the Parkway, and the Blue Ridge Parkway. She introduces Zika Rea of ZAP Fitness. Zika Rea of ZAP Fitness addressing the crowd. 4:05 p.m. – Ms. Rea approaches the microphone and she discusses the benefits of a greenway in our area. She talks about her founding of ZAP Fitness with her late husband ten years ago in Blowing Rock. ZAP Fitness is a running camp for adults and post college competitive runners. Ms. Rea begins reading a list of businesses and groups involved in completing this section of greenway. It takes her about five minutes to read the list. 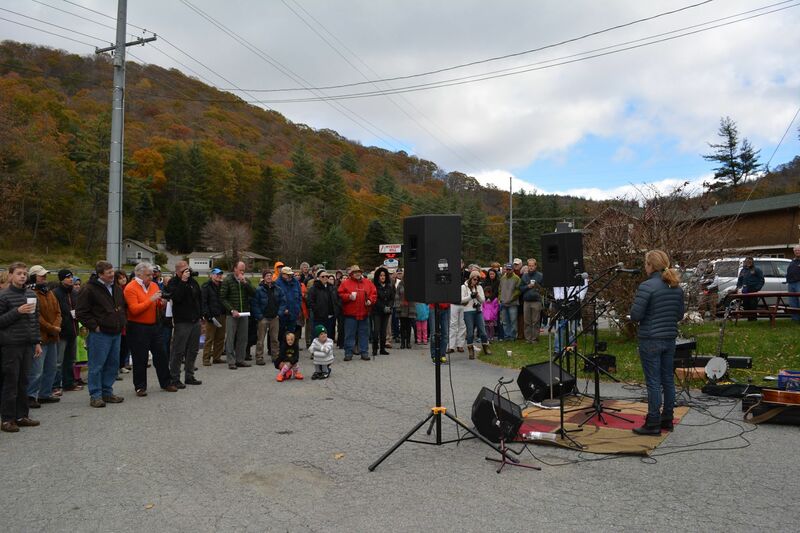 4:12 – Ann Browning introduces Mayor Ball of Boone, Mayor Lawrence of Blowing Rock, and County Commissioner Kennedy. All three approach the stage. Mayor Ball speaks first. 4:13 p.m. – Mayor Ball discusses his enthusiasm for the trail and talks about Boone’s role in the greenway. He says, “Outdoor recreation is a strong tourist economic driver in our area.” He goes on to talk about the economic and health benefits of greenways. He also mentions the existing three-mile greenway in Boone and how the Middle Fork Greenway will connect to it. 4:16 p.m. – Next up is County Commissioner Kennedy. He jokes that the trail won’t make it to Bethel, NC any time soon. Bethel is a community where he lives. Like Mayor Ball, he discusses the health and economic benefits of the trail. He states that the county is supportive of the trail and they look forward to seeing more completed sections. 4:18 p.m. – Mayor Lawrence mentions that he initially heard this idea 25 years ago and he’s glad to see it’s finally moving forward. He talks about the economic benefits of the trail in terms of tourist dollars. “I look forward to another ribbon cutting in two years,” he says. Mayor Ball (left) and Mayor Lawrence (right) cut ribbon. 4:21 p.m. – Ann Browning thanks the speakers and quickly corrects Mayor Lawrence by saying that we’ll have a ribbon cutting every year. She then directs the crowd to gather by the green ribbon on the greenway. Mayor Ball, Mayor Lawrence, Commissioner Kennedy, Council Woman Lynn Mason of Boone, and several other local officials gather around the ribbon. Mayor Ball holds the large scissors and Mayor Lawrence, and Commissioner Kennedy assist. The ribbon held together by Velcro cuts as planned. The crowd cheers. 4:26 p.m. – Ann Browning announces that everyone should now walk the length of the trail and she quickly organized a group of children to be the first people through the culvert. Politicians and community members all walk the length of the greenway which is approximately 1.1 miles along the Middle Fork of the New River. The trail dead ends past Sterling Creek Park so the group turns around and walks back to the Mystery Hill parking lot. 4:45 p.m. – The crowd is thinning as people head back to their cars in the Tweetsie parking lot. Mountain Radio continues to plays as the food and drinks are packed up and the area is cleaned. 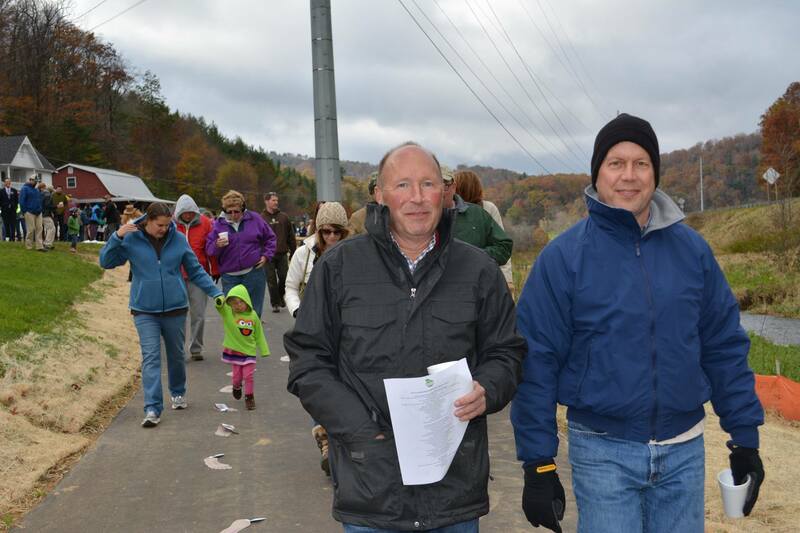 Blue Ridge Conservancy Executive Director, Walter Clark (left) and Blue Ridge Conservancy Board Member, Steve Wiley (right). Pete and Zika Rea of ZAP Fitness.